The island of Menorca (Minorca) is a true Mediterranean gem; unspoilt countyside, beautiful beaches, prehistoric sites, a wealth of wild flowers, wild tortoises, butterflies, bird life, historic towns and relics from the island's turbulent past. Such a special island deserves only the best so Walk! Menorca (3rd edition) has been researched to our 'no compromise' standards so that you can embark on the adventures confident that the routes work. For our 3rd edition we have nine new routes, including the best sections of the Cami de Cavalls, but have lost seven old routes due to access problems. The result is 44 fully detailed walk itineraries ranging from town walks around Ciutadella and Mao (Mahon) to adventurous and exciting adventures suitable for a wide range of fitness levels. You will find routes suitable for families, ranging up to whole day adventures, so that everyone will find all the walking adventures you might need in Menorca's most popular walking guide book.Every walking route has; Walking Route Summary; Ratings for Effort, Time, Distance, Ascents/Descents and Refreshments; Fully detailed walk description with frequent timings to aid navigation; full colour 1:40,000 scale Tour & Trail Map of the route; GPS waypoints for key points on all country routes. Some of Menorca's riches can be reached by car, but to truely get the best from the island you should set out on foot to discover these beautiful landscapes and beauty spots. Simply add our new Menorca Tour & Trail Super-Durable Map (5th edition 2013) to Walk! 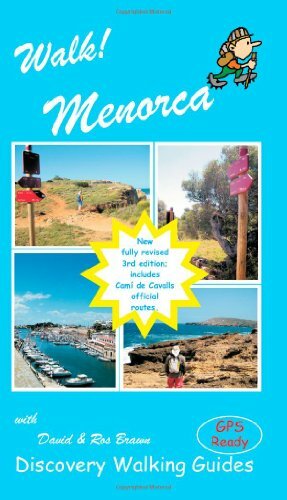 Menorca (3rd edition) and you have everything you need to enjoy a range of memorable adventures on this beautiful island. GPS Waypoint files for Walk! Menorca are available as free zip download from Discovery Walking Guides website. Walk! Menorca 3rd edition - Contents The Authors. Cami de Cavalls - Menorca's Jewel. Introduction:- Menorca - The Living Museum. Flora & Fauna. The Quirky Side of Menorca's Land Ownership. Symbol Rating Guide & Notes. Using GPS on Menorca. Map Information. Location Maps. Map Notes & Map Legend.THE WALKS 1 Ciutadella Town Walk 1 walker, 11/2 hours, 31/2-4 kilometres, ascents & descents 20 metres, 4 refreshments (circular). 2 A Stroll Around Mao 1 walker, 11/2 hours, 4-41/2 kilometres, ascents & descents 50 metres, 3 refreshments (circular). THE EAST 3 From Town to Town: Mao - Es Castell 2 walker, 1-11/2 hours, 4-5 kilometres, ascents & descents 50 metres, 3 refreshments (linear). 4 Cala Figuera - Trepuco - Sant Lluis 2 walker, 1 hour, 41/2 kilometres, ascents 85 metres, descents 40 metres, 3 refreshments (linear). 5 Sant Lluis - Pou Nou - Trebaluger 2 walker, 11/2 hours, 6 kilometres, ascents & descents 30 metres, 0 refreshments (linear). 6 Guards, Guards! 3 walker, 1 hour, 3 kilometres, ascents & descents 100 metres, 1 refreshments (circular/panhandle circular). 7 Cala de Sant Esteve to Binissaida 3 walker, 1 hour, 4.5 kilometres, ascents & descents 60 metres, 0 refreshments (linear). 8 Linking the Resorts: Binibequer Vell - Punta Prima 2 walker, 11/2 hours, 6 kilometres, ascents & descents 60 metres, 3 refreshments (linear). 9 Coastal Discovery 2/3 walker, 1 hour, 4 kilometres, ascents & descents 60 metres, 3 refreshments (linear).10 From New to Old: S'Algar - Binissaida + Cala d'es Rafalet 3 walker, 2 hours, 9 kilometres, ascents & descents 100 metres, 0 refreshments (linear). 11 Cami de Biniatap 2 walker, 1 hour, 4.5 kilometres, ascents negligible, descents 40 metres, 0 refreshments (linear). 12 An Historical Tour 2 walker, 1 hour, 4.5 kilometres, ascents & descents 70 metres, 0 refreshments (linear). 13 More Historical Sights: Mao - Talati de Dalt - Rafal Rubi Vell 3 walker, 21/2hours, 12 kilometres, ascents & descents 50 metres, 0 refreshments (linear + return). 14 S'Albufera: The Three Routes 1 walker (all 3 routes), 1/2 hour, ...hour and 25 minutes. 15 Es Grau Peninsula 3 walker, 1 hour, 3 kilometres, ascents & descents 110 metres, 3 refreshments (circular/panhandle circular). 16 Torre Blanca 3 walker, 21/2 hours, 8.5 kilometres, ascents & descents 180 metres, 3 refreshments (linear + return). 17 Cap de Favaritx to Es Grau 3 walker, 3 hours, 10 kilometres, ascents & descents 220 metres, 3 refreshments (linear). 18 Cala Mesquida to Es Grau 4 walker, 2-3 hours, 7 kilometres, ascents & descents 200 metres, vertigo risk, 3 refreshments (linear).18A Cala Mesquida - Cami de Cavalls - Es Grau 3-4 walker, 2 hours, 6.5 kilometres, ascents & descents 200 metres, 3 refreshments (linear). THE WEST 19 Cala Blanca to Cap d'Artrutx 2 walker, 11/2 hours, 6 kilometres, ascents & descents 30 metres, 4 refreshments (linear). 20 Galdana Gorge 1 walker, 11/2 hours, 7 kilometres, ascents & descents negligible, 3 refreshments (linear + return). 21 Cala de Santa Galdana to Cala Macarella 2/3 walker, 45-55 minutes, 2-21/2 kilometres, ascents & descents 60 metres, 3 refreshments (linear). 22 Cala Macarella to Ciutadella 3 walker, 4A hours, 18.5 kilometres, ascents & descents 150 metres, 4 refreshments (linear). 23 Cala Galdana to Sant Tomas 3 walker, 21/2 hours, 9.5 kilometres, ascents 250 metres, descents 300 metres, vertigo risk, 4 refreshments (linear). 24 Cami de Cavalls stage 14 - Cala Galdana to Sant Tomas 3-4 walker, 2.5-3hours, 11 kilometres, ascents 200m, descents 160 metres, 4 refreshments (linear). 25 Cala de Santa Galdana - Son Saurer - Cala'n Bosch 4 walker, 4 hours, 15 kilometres, ascents & descents 200 metres, 2 refreshments (linear).26 Cala Galdana to Ferreries via Barranc d'Algendar 3 walker, 31/2 hours, 14 kilometres, ascents 230 metres, descents 190 metres, 2 refreshments (linear). 27 Ciutadella - Barranc d'Algendar - Ferreries 3 walker, 41/2 hours, 17 kilometres, ascents 240 metres, descents 200 metres, 2 refreshments (linear). THE SOUTH 28 Sant Tomas to Son Bou to Sant Tomas 3-4 walker, 3 hours, 13 kilometres, ascents & descents 100 metres, 4 refreshments (circular/panhandle circular). 29 Sant Tomas to Cova des Coloms 3 walker, 2 hours, 71/2 kilometres, ascents & descents 130 metres, 4 refreshments (circular/panhandle circular). 30 Cales Coves Circular 3 walker, 1 hour, 3 kilometres, ascents & descents 80 metres, 0 refreshments (circular). (B) 3 walker, 1 hour, 4 kilometres, ascents & descents 60 metres, 0 refreshments (circular). 31 Son Bou to Cala en Porter on the Cami de Cavalls 3 walker, 21/2 hours, 8.5 kilometres, ascents 200 metres, descents 170 metres, 2/3 refreshments at end (linear one way). 4 walker, 5 hours, 17 kilometres, ascents & descents 370 metres, 2/3 refreshments (out and return). 32 Cala en Porter to Es Canutells 3 walker, 11/2 hours, 6.5 kilometres, ascents & descents 200 metres, 3 refreshments (linear one way).3/4 walker, 3 hours, 13 kilometres, ascents & descents 400 metres, 3 refreshments (linear out & return). 33 Es Canutells to Binibequer Vell 3 walker, 2 hour, 8 kilometres, ascents 80 metres, descents 120 metres, 5 refreshments (linear one way). 4 walker, 4 hours, 16 kilometres, ascents & descents 200 metres, 5 refreshments (linear out and return). CENTRAL ROUTES 34 Santa Agueda 3 walker, 1 hour, 3 kilometres, ascents & descents 180 metres, 0 refreshments (linear + return). 35 Ferreries to Barranc d'Algendar Gorge + Surprises 3 walker, 3 hours, 10.5 kilometres, ascents & descents 200 metres, 2 refreshments (circular). 36 Alaior Circular 3 walker, 2 hours, 8 kilometres, ascents & descents 120 metres, 0 refreshments (circular). 37 Ferreries to Son Mercer 3 walker, 2A hours, 11 kilometres, ascents & descents 120 metres, 0 refreshments (linear). THE NORTH 38 Milly and Izzy's Pocket Adventure 2 walker, 1 hour, 2.5 kilometres, ascents & descents 60 metres, 3-4 refreshments (circular). 39 Fornells to Playa Fornells and return 3 walker, 2 hours, 6 kilometres, ascents & descents 120 metres, 5 refreshments (linear + return).40 Cala del Pilar 3 walker, 80 minutes, 4 kilometres, ascents & descents 160 metres, 0 refreshment (linear + return). 41 Cala Pregonda 2 walker, 50 minutes, 4 kilometres, ascents & descents 80 metres, 3 refreshments (linear + return). 42 Cap de Cavalleria to Binimel-La 3 walker, 21/2 hours, 7 kilometres, ascents & descents 120 metres, vertigo risk, 4 refreshments (circular). 43 John's Route: Na Macaret Circular 3 walker, 21/2 hours, 11 kilometres, ascents & descents 120 metres, 3 refreshments (circular). 44 Cami de Cavalls to Arenal d'en Castell 3-4 walker, 4-5 hours, 18 kilometres, ascents & descents 160 metres, 2/4 refreshments (linear + return). Glossary. Appendices:- Maps & Books, Miscellaneous Information, Owzat! - Cricket at the MCC, Bus Timetables, Place Names Index.